If the death was expected and has occurred at home, in the first instance the Doctor who has been attending to the deceased during their final illness should be contacted. The Doctor may write the medical certificate of death when they visit the home or they may request that you attend the surgery to collect it. If a death occurs in the home outside of normal surgery hours, a deputising Doctor ( On call doctor ) may attend and issue a ‘Certificate of Attendance’ which will need to be passed onto the Doctors surgery when it reopens. If the death was unexpected the emergency services along with the Police should be contacted. In the event of an unexpected death the Coroner may become involved. If there is no explanation for death available immediately the deceased will be removed to the Public Mortuary (For Northern Ireland this is situated at The Royal Victoria Hospital). Once the Coroner has investigated the circumstances of death they will contact the family to advise them accordingly. 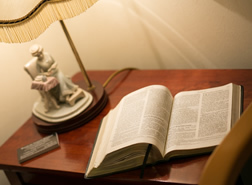 Upon being informed by the Coroner that the deceased’s cause of death has been established Sandy Close Funeral Services will liaise with the coroner and mortuary to arrange bringing the deceased into our care, the family will be kept well informed. It is advisable to contact your chosen funeral director as soon as possible. They will advise on all the procedures and will undertake the responsibility in dealing with the Coroners office on your behalf. Unless present when death occurs, the relatives will be notified by the nursing staff as soon as possible. Arrangements can then be made with the hospital doctor dealing with the patient or nursing staff to deal with the formalities. These will include collecting the ‘Medical Certificate of Cause of Death’ (issued by a Hospital Doctor) and personal possessions of the deceased. If the family decide upon cremation then it is important to let the hospital know at this time, this is to enable the relevant doctor to complete all documentation required. As per procedures the deceased will be transferred to the hospital mortuary. As your UK Funeral Director, we work together with you, an overseas Funeral Director and the British Consulate or Embassy to organise the necessary documentation and transportation of the deceased. Bringing someone home for burial or cremation doesn’t have to be complicated, but bear in mind that you are responsible for the travel costs and funeral directors fees unless you are covered by travel insurance. Transportation (Repatriation) from the UK for committal abroad is also part of our service. In a case of a sudden, unexpected or industry related death, a Coroner is required to investigate the circumstances of death. It then becomes the Coroners responsibility to determine how and why an individual died. The Coroner and their Officers are working in your interest and will always keep you up to date with any issues that may affect the funeral arrangements. There may be no ‘Medical Certificate of Death’ issued. Instead the Coroner will advise you of the relevant procedures necessary to proceed with the registration of death. During your first contact with your funeral director they will explain and advise you on all the procedures involved in dealing with the coroner.